Miniatures – Just Stop and Paint It! 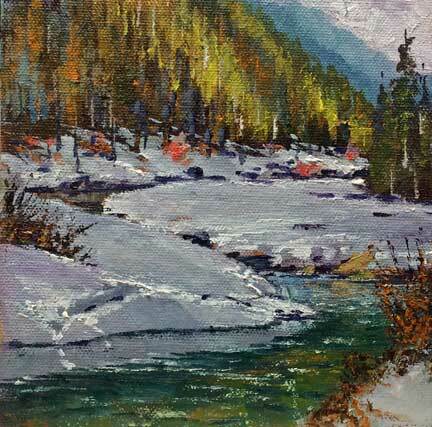 This is just a little 5×5 painting, and didn’t take long to do, but brought back a flood of memories. 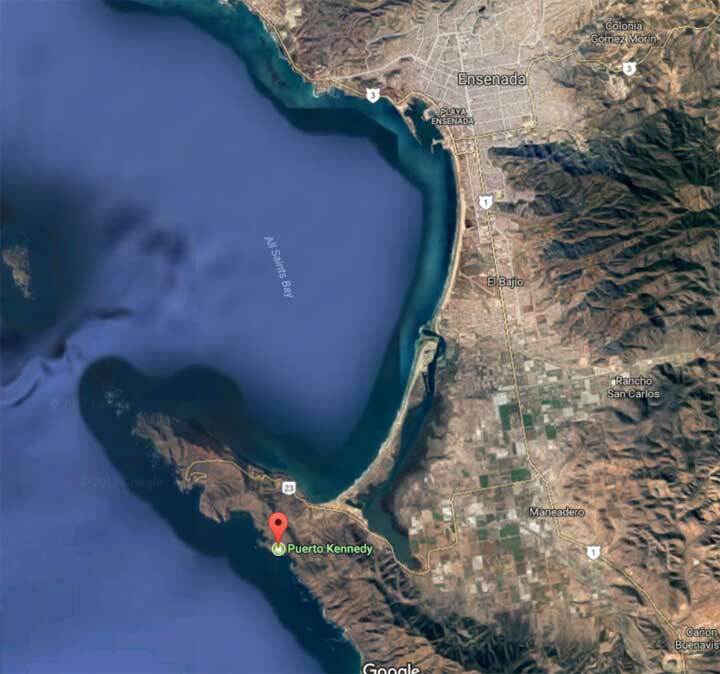 It could be on almost any coastline on any continent in the world, but it is actually in Baja California, Mexico. It was the middle of nowhere with dirt roads, no facilities, no other people, etc. We camped right above Puerto Kennedy, and at night we could only see one light many miles down the coast. It was an ‘iffy’ area, and I wouldn’t go there today. Even back then Bob was ‘packing’. The others took to the water and soon were hauling up fish on their spearguns. Well, I wasn’t much of a snorkeler as it was my first true snorkeling adventure in the ocean, but the water, fish, coral, and surroundings were absolutely beautiful. After getting woozy bobbing up and down in the incoming swells, shivering in the cold water (even with a wetsuit on), loosing a swimfin, which Bob had to go dive for, I decided to spend the rest the of weekend sketching the area. 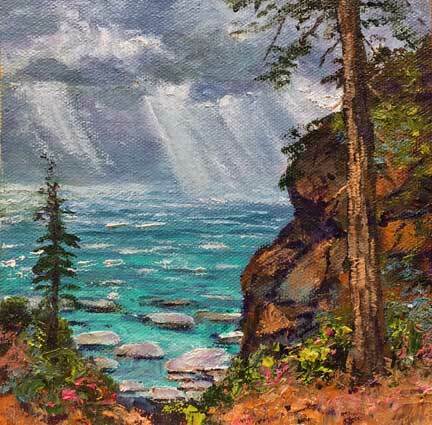 When we got back to Pasadena, I soon painted several paintings from the trip, including a large painting, similar to this mini, and it won second place in a local art competition. It was certainly a fun adventure! 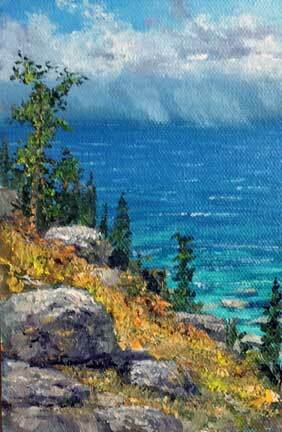 By the way, in case you missed them on social media, here are a few more miniatures of Lake Tahoe just completed. That’s it for now! Thanks for stopping by! 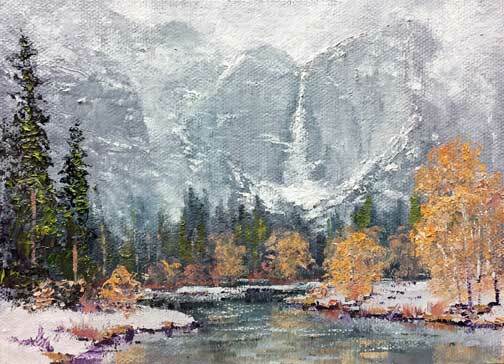 Continuing my seasonal miniature paintings, here are three more, all in Yosemite National Park. 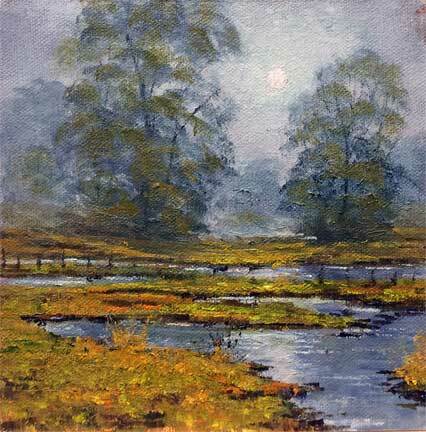 I have already sold a number of miniatures this season and am departing slightly the 6×6 square format to other sizes. Dropping a total of 2,425 feet, Yosemite Falls is the highest waterfall in Yosemite National Park, and one of the highest on the globe. 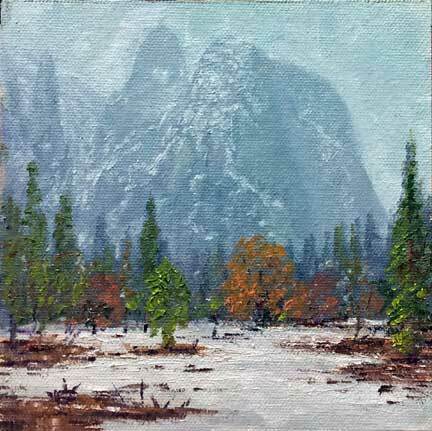 Here’s another 6×6 in Yosemite National Park. 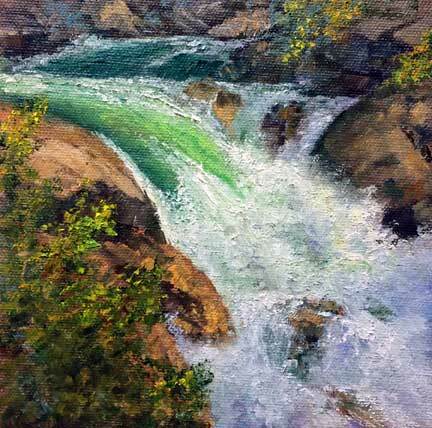 This is one of the falls or cataracts as the Merced River tumbles out of Yosemite Valley. Built in 1922, Yosemite Creek Bridge is the oldest stone bridge in Yosemite Valley, spanning Yosemite Creek below Yosemite Falls (shown above). There are more on the easel, so stay tuned! Here’s three more 6×6 mini’s. I started with the Elkhorne piece, then decided to do a few more misty moods. Maybe I should have named them Mystic Moods, after the orchestra popular in the 60’s and 70’s. You have to be pretty old to remember them! Elkhorn Slough is a tidal slough and estuary on Monterey Bay. It is the largest tract of tidal salt marsh in California outside of the San Francisco Bay. 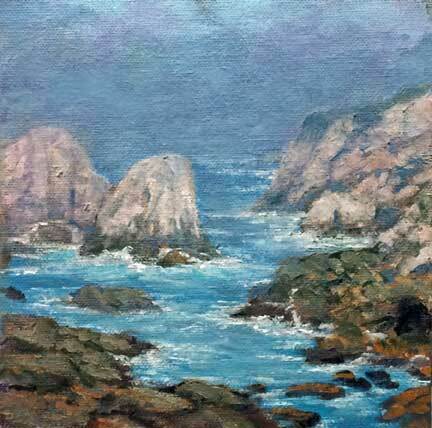 Garrapate State Park is just south of Carmel, CA, and my favorite place to paint on the Pacific Coastline. I actually took a scene in full daylight and changed it to a foggy day…they call it artistic license. What can I say about Yosemite? 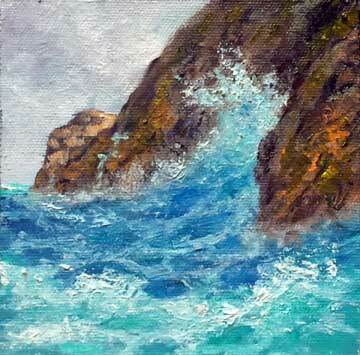 I did this painting almost exactly from a photo I took in 2010. This might make a good subject for a larger painting…what do you think? Hang on, more mini’s coming up! Around this time of year I paint a number of miniatures. They make great holiday gifts, or anytime gift for that matter, and they usually sell fairly quickly. 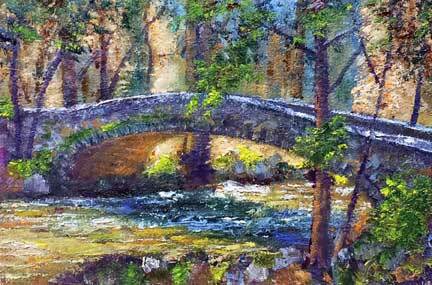 I also paint them for both gallery and juried miniature shows this time of year. Many times, these are miniatures of larger paintings I have done, or studies for possible new larger paintings later on. I am starting off with a trio of 6×6 pieces. 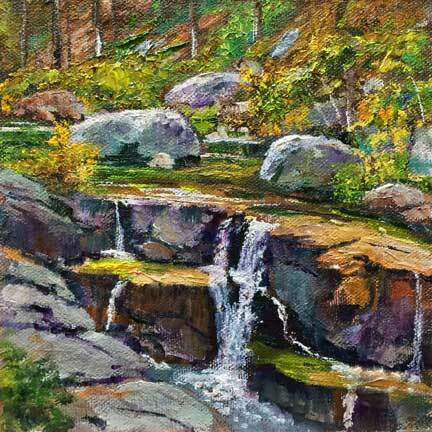 Some experienced artists can probably guess which juried show I might enter these! 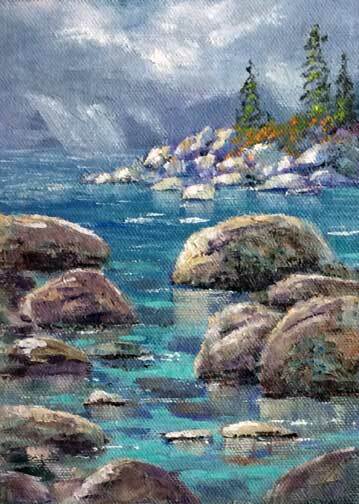 Thats it for now…more on the easel. The next batch, a little more ‘moodier’ are on the way.